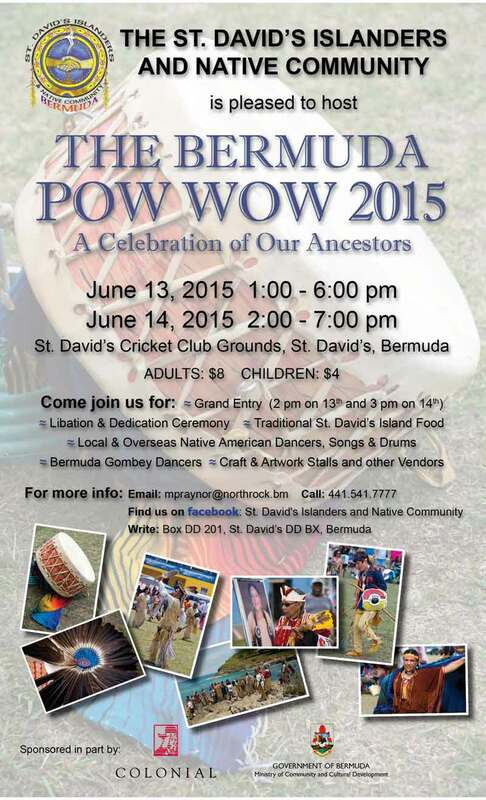 Forty visitors from overseas are expected to attend when the St. David’s Islanders and Native Community host the Bermuda Pow Wow 2015 on June 13th and 14th at the St. David’s Cricket Club Grounds in St. David’s. Admission will be $8 for adults, and $4 for children. À move in the right direction per Bermuda’s indigenous population. Many descendants of the Pequots are here as well as other indigenous populations from the mainland Americas(America), note: BDA is within the Americas(America). It’s time to cease with the erroneous “black” status classification and come to the 21st century with our indigenous aboriginal corrected status. Inquisition operations(Spanish) are still active across the world but slowly but surely a critical mass is forming to change this awful and pernicious paradigm. I think this event is great. Howevet Indigenous means “belonging to the original inhabitants” of a place. Singling out who is amd who is not indigenous is not very productive, but if someone wants to do it, that’s what it means. We cannot do anything about the past but must look forward to a create a loving Bermermuda with tolerance for all. bones in the Americas bear resemblance to modern Africans, East Asians and Australians. Go figure. The first Americans were not Mongoloid but look like what is considered albeit erroneously a black person.